This is a great simple dressing that I served with the portobello pitas. I have no idea if this version is truly authentic but it tastes great. Peel and dice the cucumber. Salt generously and allow them to sit; the salt will pull off some of the excess liquid. Combine the ingredients and mix well. If you don’t like the strong yogurt taste, you could use half sour cream and half yogurt. Hey that’s an imposter! Kidding, looks great to me. 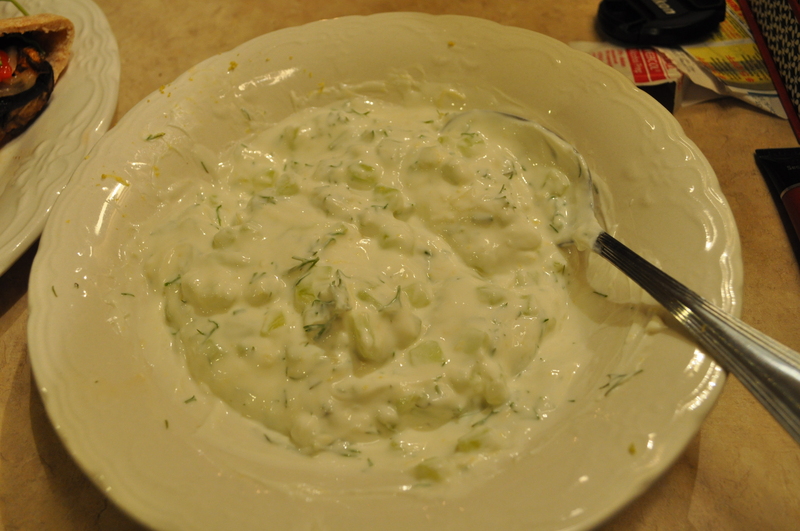 I love tzatziki sauce! So good with just about anything. I drain the yogurt off in a cheesecloth and it makes it extra thick…yum!